1. Review by Mike Sanders Jackson, June 8 1975 2:30 pm. 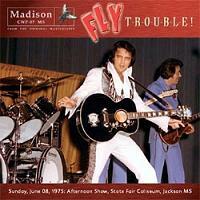 This CD contains the concert performed in the afternoon of 8 June 1975 at the State Fair Coliseum in Jackson M.S. 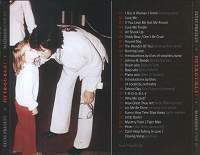 Like other concerts during this tour, the show is incomplete, missing the opening 2001 intro, 'See See Rider' and 'I Got A Woman' as well as the start of 'The Wonder of You' and 'Let Me Be There'. Once again, Madison have excelled in their presentation, giving us a 12-page booklet of colour photos from the show and others from the same tour. Even the inlay tray contains an unusual colour photo of Elvis in a go cart. It is quite frankly superb! So it is particularly disappointing to write that the sound quality of this show is so poor for a soundboard recording. From the outset, the sound is very bright and noisy with a lot of hiss and it seems to deteriorate further so that the guitars sound increasingly jangly, especially on the later songs. The sound overall is spoilt by an underlying blanket of treble noise forming waves of distortion, which is a great shame, as the show itself is good and is fun to listen to. The reason for the title of this CD “Fly Trouble” is that the stage area is swarming with flies, so there are frequent jokes and references to them throughout the greater part of the show. Elvis’s opening comment "you can tell Jo Guercio’s back, there are flies all over the place" sets the scene. During 'Love Me', he sings "tear it all apart - damn flies". At the end of 'If You Love Me', he exclaims "I’m going to get a fly swatter". After 'Love Me Tender', he jokes with the crowd "You people paid all this money and drove all this way to watch us swat flies up here on the stage!" - And so on…. Very amusing and it makes for a memorable show. His rapport with the audience is also amusing and captivating and there is a fair amount of it in this show. After teasing the girls at the ringside by announcing that he is the "Southern distributor for The Creeping Crud", he asks one girl what she wants- "Your body" is the immediate reply! After what must have been an over passionate kiss he announces "I’m going straight to church after this". Later a fan presents him with a school photo of himself and he tells her; "See, I had dreams of becoming a big truck driver at that time-still do!" Clearly he was in a good mood and enjoying himself, as with all other shows from this tour. As for the music, the songs are all performed well enough, the highlight undoubtedly being 'How Great Thou Ar't which is sung with two reprises, after a further request to repeat it, from a fan at the ringside. The second reprise also features an impressive sustained high note at the end, proving that he was in good voice for this show. 'Mystery Train' also receives a good performance, although the sound quality leaves a lot to be desired. Just before closing the show, Elvis gets a request for 'Fever', which he accepts, asking the band, "Do we know Fever?" Amazingly enough, neither Elvis nor the band are able to find an appropriate key, despite having been a regular concert song, and after two attempts he aborts it, going straight into 'Can’t Help Falling in Love'! All said, this is an entertaining show which focuses on Elvis’s warmth and interaction with his fans, presented with superb packaging, and as such can be recommended. However musically I doubt you will return to this show because of the poor sound, when we have other shows from this tour in much better quality. My own favourite being Deep Down South, and the general consensus for the best sound quality being Let Me Take You Home, the closing show from Memphis.